I have bought several ready to use wine aroma kits during my tenure as a sensory scientist. My major complaint at the time was that the aromas tended to degrade if not properly stored. 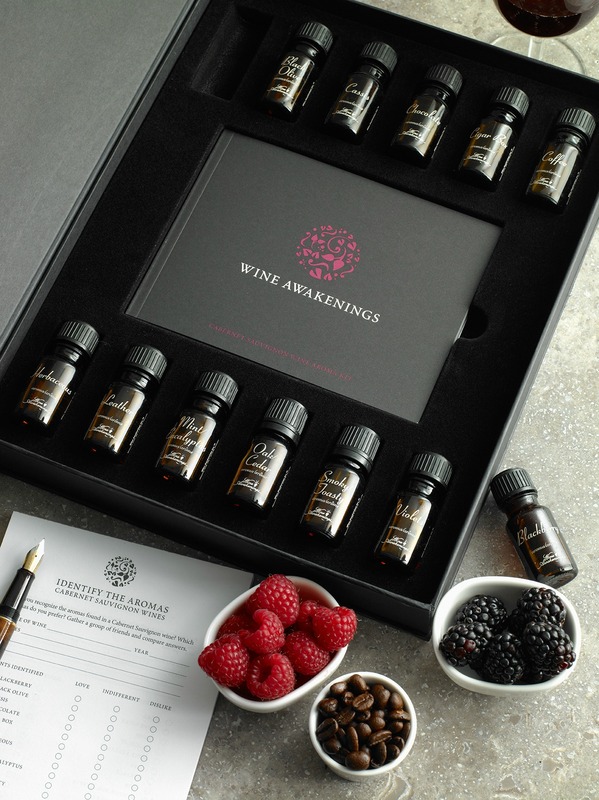 Recently, I have had the opportunity to use the Red Wine Aroma Kit designed by Wine Awakenings and I was impressed by the quality of the materials they used. I have worked with Wine Awakenings for several few years now as they have had the brilliant idea to include Dr. Noble’s wine aroma wheel in their kits. The utilization of the combined tools facilitate definitely your ability to be more descriptive during a wine tasting. I reached out to Amato De Civita, Wine Awakenings owner, to check on their ready to use wine aroma kits. Amato offered to send me the Red Wine Aroma Kit and here is my review. 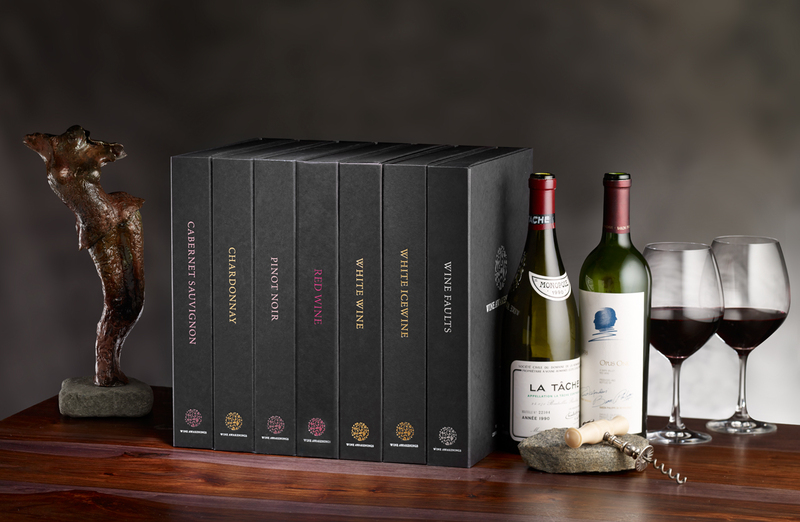 The Red Wine Kit includes 12 aroma references; all are flavor compositions designed to evoke typical wine aromas and are guaranteed to last for 10 years. I reviewed the kit with two of my wine friends who happened to be visiting on a weekend. We smelled each flask blind, without looking at the label or the manual, described individually what we perceived, and then compared our notes. Overall, the aromas were quite intense and complex because we each used more than one descriptor to characterize each scent. The complexity was expected as these references are composition of several compounds; although the intent is to design a well rounded aroma, easily identifiable, the composition is so intense that some compounds seem to spike higher than others and that’s what we detected. We resolved to use Q-Tips as a way to decrease the aromatic intensity. For each scent, we applied one drop on a Q-tip and this made the evaluation easier; the dominant attribute was in most cases more distinct. The results of our exercise is summarized in this table below. We found that some aromas were not representative of the associated descriptors. However, some of you may find commonalities between these scents and their respective labels. 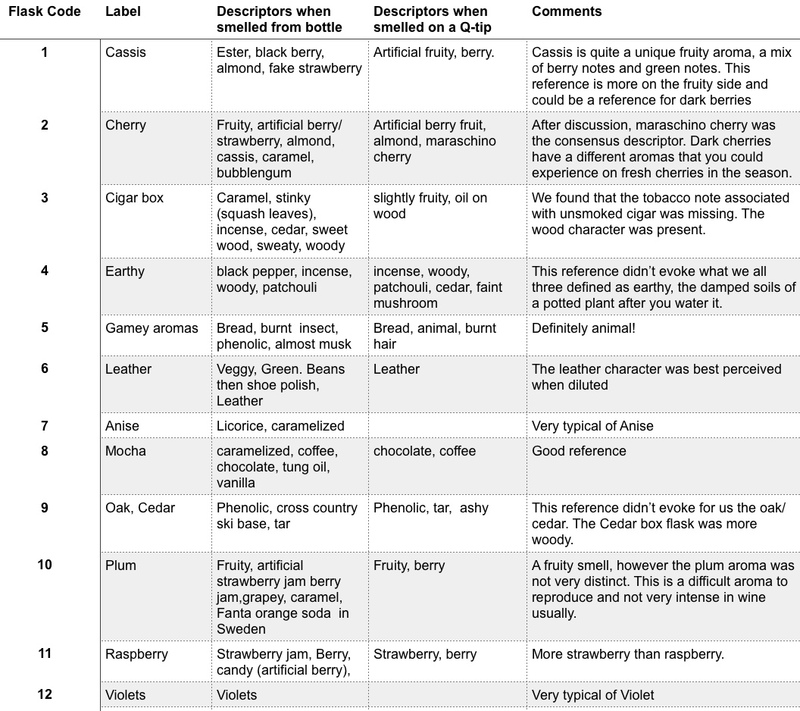 These aroma references are still good training material for initiating discussions and will certainly give you some grounds to investigate other examples of these red wine aromas. The information and instructions included in the kit are of superior quality. The ready to use kit is definitely a valuable educational tool not only for the aroma description training standpoint but also for expanding your wine education overall. The Red Wine Aroma Kit was kindly supplied by Wine Awakenings for my review, as well as the photos included in this page. Red, White, Cabernet, Chardonnay, Pinot Noir or Wine Faults. Keen on investing in the Wine Expert in the box or the Wine Master kit?